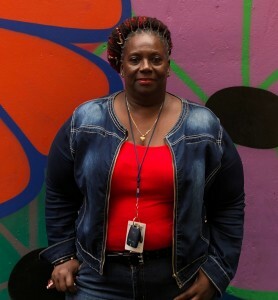 When Irma Williams joined the Barrier Free Living apartments (BFLA) social work team this past year, she brought a skill set she’d developed over a decade. Originally from Guatemala, Irma grew up in lower Manhattan and started out as a peer program assistant at Boom Health (formerly citywide harm reduction.) During her time at Boom, she earned a master’s degree in social work from Hunter College and was promoted to the social work team. BFLA, which opened in 2015, offers permanent homes with support services to formerly homeless survivors of domestic violence, and has both a family and a singles building. Irma was drawn to Barrier Free Living after she watched a short film on the agency website about Project Giveback, where former shelter tenants return to do service at the agency. (see the films on our website featuring mural artist Thomas here and on Vimeo. “I saw that Barrier Free Living’s mission empowered people to seek independence, that’s what drew me to apply,” she says. This October, Irma is the team leader for Barrier Free Living’s first clothesline project at BFLA, as part of domestic violence awareness month. The clothesline project, a nationwide phenomenon, is a community event where participants make T-shirts as a way to support survivors and increase awareness. The event is October 5 from 10am-3pm (more info. on this page).